...and my "Army other than Clan Rats" is coming together well. Thanks to a very generous Fight Club member, I grabbed a bag of OOP metal Skaven at League Night this Tuesday. I plan on buying a few more used models this week to hopefully have a 1000 point army at least when the Army Book and Clan Rats come out. So far this is what I'm planning on having (need to still get the *). I don't know what points that will be. 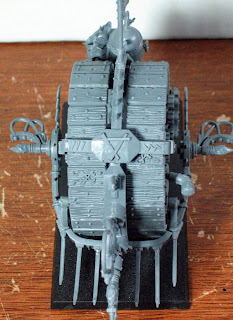 I plan on getting 3 boxes of Clan Rats and the army book. 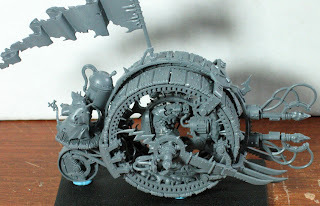 If I don't get it, the next purchase after that will be the Doomwheel along with more Clan Rats. 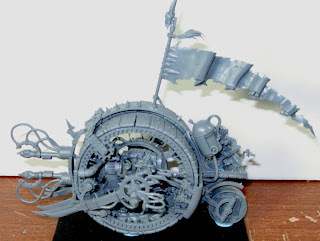 And when the Bell/Furnace box comes out the month after, I will add my first Plague Furnace.